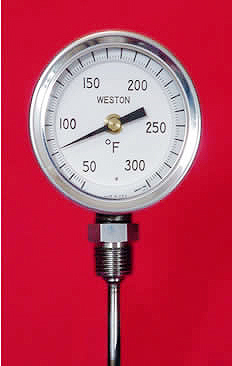 Weston Bi Metallica Thermometers - Model 4313 | Texas Valves & Instruments, LLC. 2.5" Model / Catalog No. 4" Model / Catalog No. 9" Model / Catalog No. Note: For correct indications, the stem should be immersed at least 2" in liquids and 4" in gases. Maximum head temperature 220°F (104°C} with plastic window. *Not recommended for continuous operation above 800°F.